The first tab, job configuration, allows you to add, delete, rename and configure triggers. 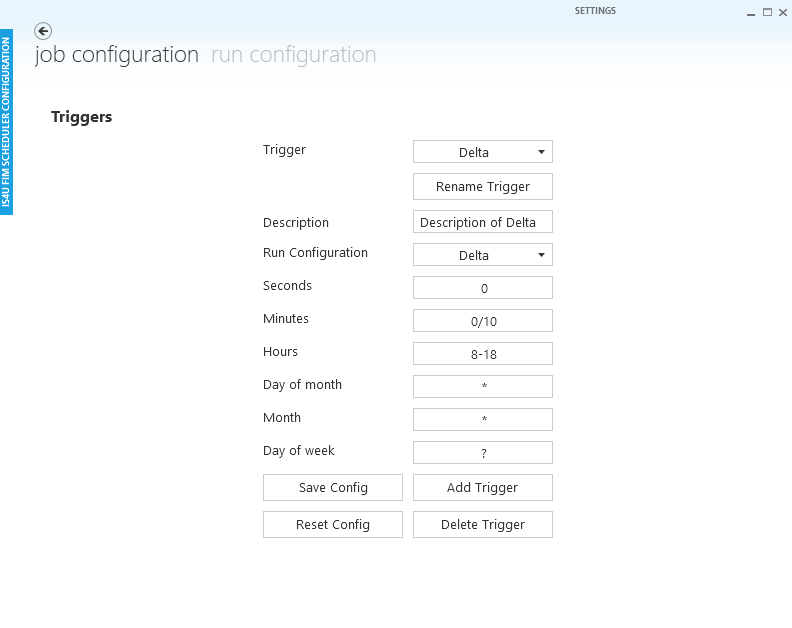 Each trigger specifies a run configuration and on which schedule this run configuration will be fired. A typical delta schedule for FIM is "each 10 minutes during working hours". This can be translated to the cron expression "0 0/10 8-18 * * ?". 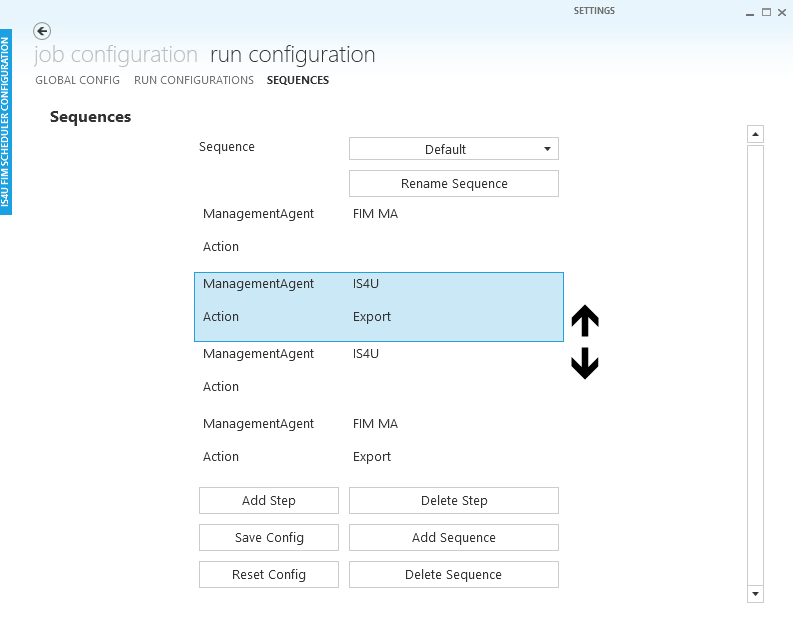 The drop down list with run configurations is automatically propagated based on the existing run configurations. Save config performs a validation of the cron expression using the job_scheduling_data_2_0.xsd schema file. If valid, JobConfiguration.xml is saved. A backup of the previous configuration is saved as well. Reset config reloads the interface using the configuration in the file on disk. Save config performs a validation using the RunSchedulingData.xsd schema file. If valid, RunConfiguration.xml is saved. This includes the settings of all three tabs under run configuration. A backup of the previous configuration is saved as well. Reset config reloads the interface using the configuration in the file on disk. The default run profile is the top most action. Steps that do not have an action defined, take the action defined by their parent. This mechanism allows you to reuse sequences in combination with different profiles. You could have a run profile with default run profile "Full import full sync" and another with "Delta import delta sync". Then both of them could use the same sequence resulting in different actions. This mechanism only works if using a naming convention for run profiles in all connectors in the FIM Synchronization Engine. Run profile names are case sensitive. 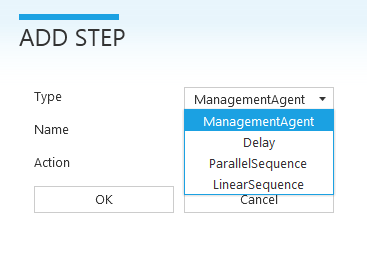 If the scheduler tries to start a run profile that does not exist, the management agent will not be run. 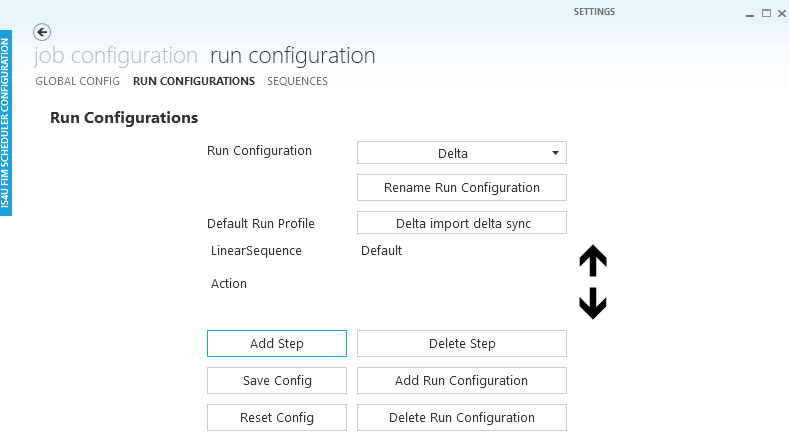 In the example here, the sequence Default will be run with run profile "Delta import delta sync". 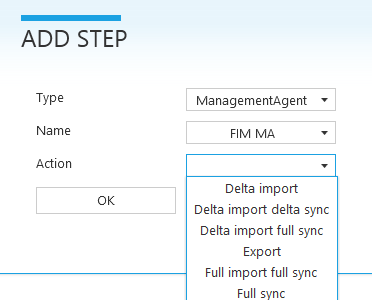 The add step button opens a new dialog where you can select the type of step. Because the server export info is read, a list of possible actions is available. However, as explained above, you do not need to specify an action. 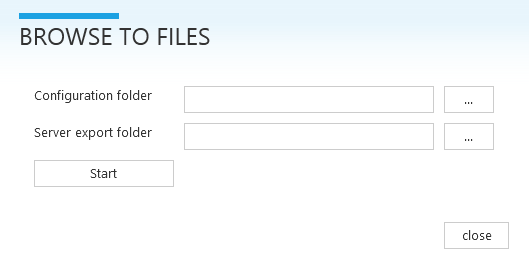 The sequences tab allows you to add, delete, rename and edit sequences. The functionality provided here is identical to the one on the run configurations tab. Whether the sequence is executed as a linear or parallel sequence is defined by the step that calls the sequence, so a sequence can be defined as linear in one run configuration (or other sequence) and as parallel somewhere else. You can find the new release of the IS4U FIM scheduler on GitHub: FIM-Scheduler Release. The setup that installs the scheduler on the FIM server now also includes the GUI tool to configure it.